September 2011 ~ I Can Do That! 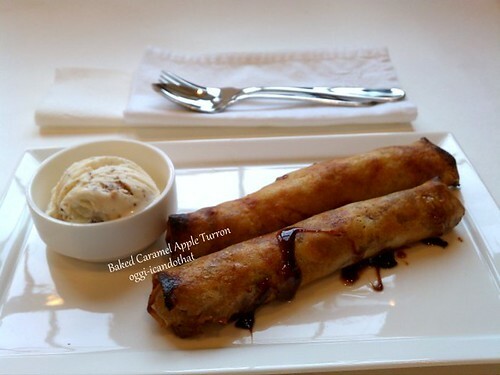 Have you tried baked turon? I have a few tart apples, cubed one and cooked it in a tablespoon of butter and 2 tablespoons dark brown sugar, filled 2 spring roll wrappers brushed with butter, and baked the rolls until they have browned and looked crispy. 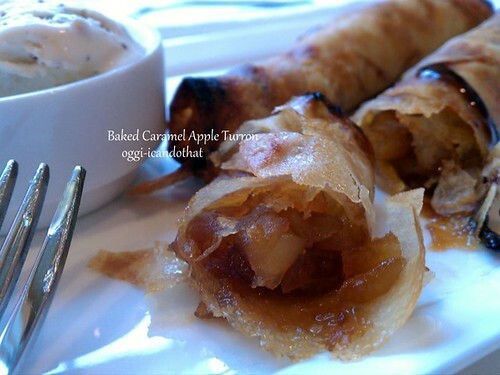 The baked caramelized apple turon is so good; tart, sweet, and buttery, and oh so crispy. 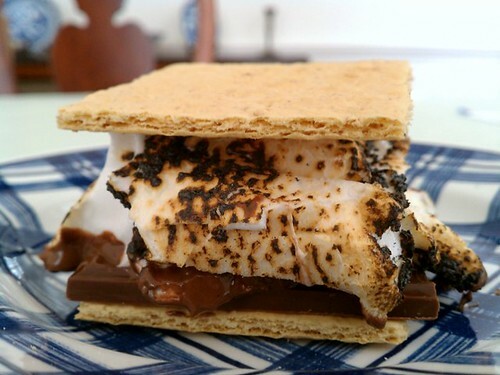 I love it with a very small scoop of Breyers® Snickers Caramel Swirls ice cream. Sweet! I'll definitely bake saba and langka turon later today now that I know it will be as crispy as deep fried. In a medium skillet, heat butter and sugar until sugar has melted. Add apples and cook until caramelized and golden brown. Brush one side of spring roll wrapper with butter. Place in a thin pile 2 tablespoons of apple across one edge of wrapper and roll, folding the edges in as you roll and keeping it tight and thin. Place on a parchment-lined baking pan. Brush rolls with butter from the skillet, if any is left, plus melted butter. 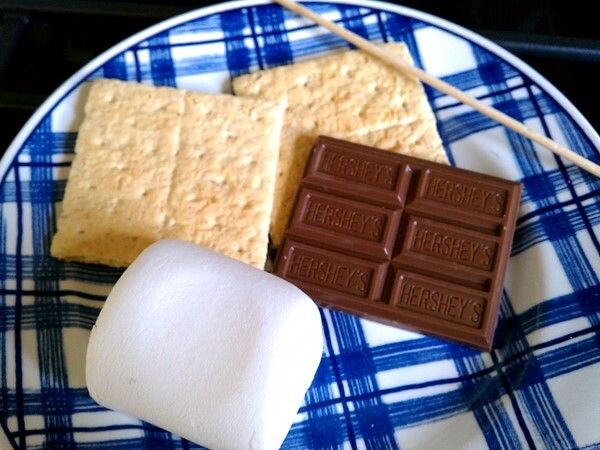 Bake until brown and crispy. Serve immediately. I love these chicharron strips already flavored with vinegar and sea salt; there's no need to dip in vinegar which could get messy. 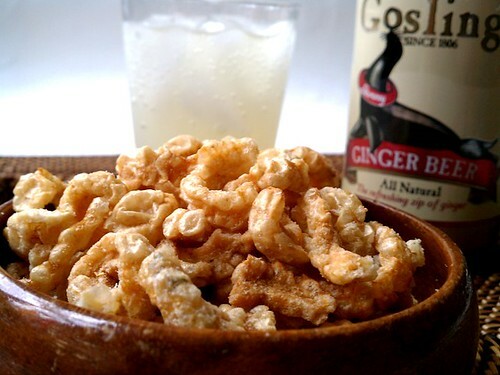 The Gosling's ginger beer, not fermented and non-alcoholic btw, which I think tastes like carbonated salabat has a very strong ginger flavor and goes well with the yummy chicharron. Peta, of the blog Peta Eats, was our lovely hostess for the Daring Cook's September 2011 challenge, “Stock to Soup to Consommé”. 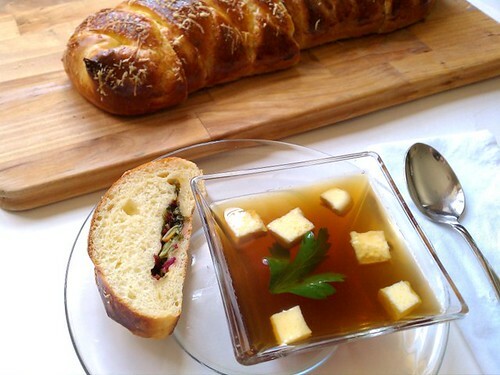 We were taught the meaning between the three dishes, how to make a crystal clear Consommé if we so chose to do so, and encouraged to share our own delicious soup recipes! I've never made consommé before but thanks to Peta and this month's challenge, I now have and enjoyed the process. Preparation of consommé is not complicated but there are several steps [including making the stock which is part of the challenge], not to mention lots of kitchen towels for straining the stock. I used the egg white method for both the chicken and beef consommé. I can't believe my eyes when the cloudy stock became clear. Consommé has to be adequately seasoned though because it loses some of the flavor when clarified. We were also asked to prepare bread or crackers to go with our soups. I baked a brioche filled with sauteed chopped baby rainbow Swiss chard, garlic, and onion, and grated Parmesan cheese to go with a simple beef consommé and cubed savory egg custard. Mix all ingredients and pour into a lightly greased 6 x 4 inch pan. Place on a steamer and steam over boiling water for 12 to 15 minutes. 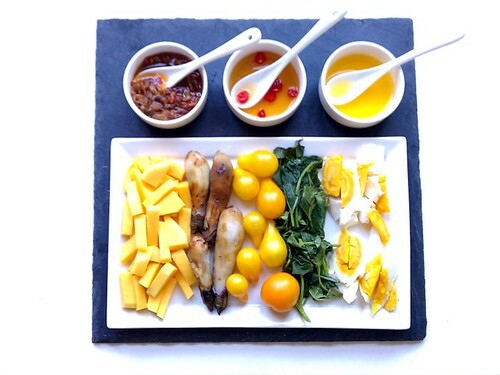 Let cool slightly, transfer into a chopping board; cut into half-inch cubes. For the Filipino pig tail sour soup, I added some beef stock to the strained pig tail stock. I used tamarind paste to sour the soup and added my favorite vegetables. 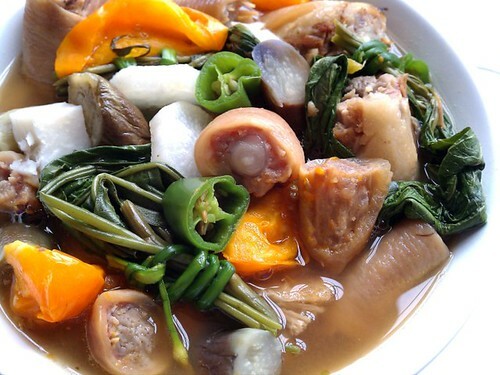 We usually eat this soup on top of a bowl of hot steamed rice with extra fish extract on the side. Stock: In a sheet pan, mix ingredients except water, and roast in a 400°F oven until pig tails and vegetables are golden brown. Transfer into a large pot, add water topping 2 inches; bring to a boil, turn heat to medium-low, cover, and let simmer until tails are tender. Remove tails to a large plate and leave until cool enough to handle. Cut into 2-inch pieces. Strain the broth, discard vegetables, and reserve 3 cups of the stock. Soup: Return the pig tails and stock to the pot, add the beef stock, tamarind paste, tomatoes, and fish extract. Taste the soup and add salt if needed. Let come to a boil, add vegetables, and boil until tender. Serve while hot. 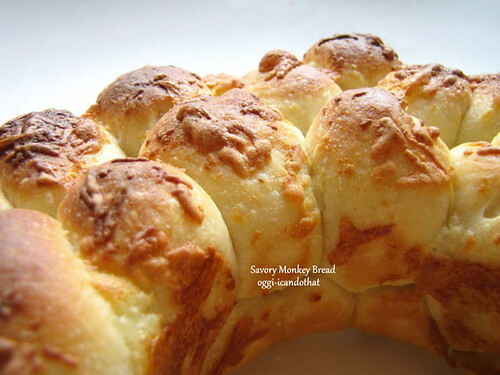 Monkey bread sounds funny and I don't know why this pull-apart bread is called such. 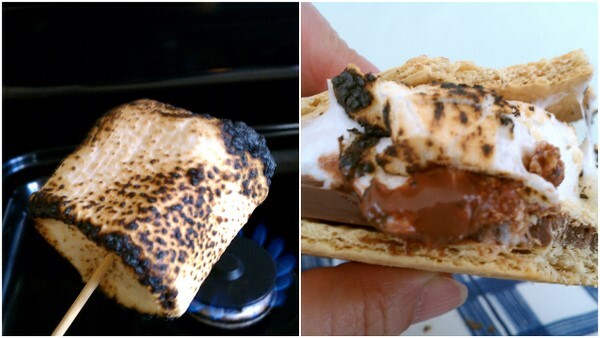 Most recipes I've seen are sweet, usually with sticky gooey cinnamon sugar and butter coating . Although I love sweet bread, I wasn't feeling it and opted for a savory one. I added cubed sharp cheddar cheese in the dough and as topping. The rolls are very soft and fluffy and great to munch on anytime of the day. 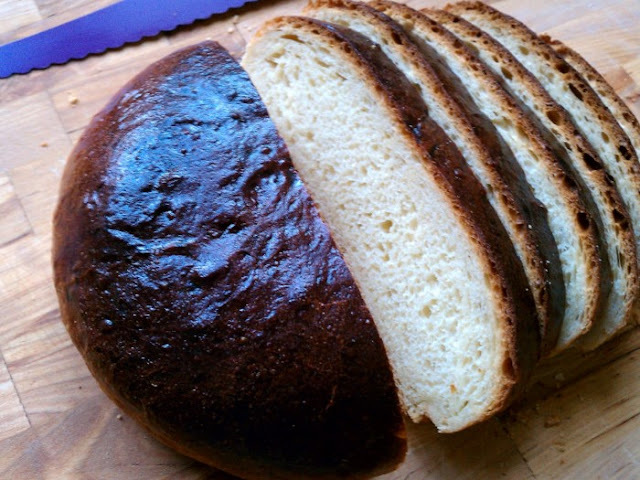 I can easily go ape over this bread. In the bowl of a standing mixer whisk together flour, instant yeast, sugar, salt, powdered milk, and garlic and onion, if using. Stir in water and oil. With the dough hook attachment, knead on medium speed for 2 minutes, scraping sides if necessary. Increase speed to medium-high and knead for 5 minutes until dough is smooth and pliable. Transfer on the kitchen counter and knead in the cubed cheese. Transfer dough into a lightly greased container, cover with plastic wrap, and let ferment for 1 to 1½ hours. Lightly knead dough, divide, and shape into 1-inch balls. 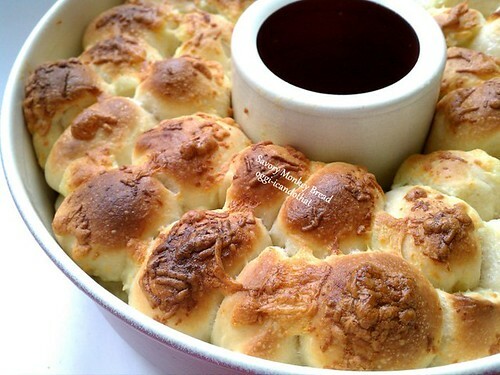 Dip each ball in the melted butter and roll in the remaining cheese. Place balls almost touching in a 10-inch round pan. Cover with plastic wrap and leave to rise for 45 minutes. Bake in a preheated 375° F oven for 25 minutes or until golden brown. 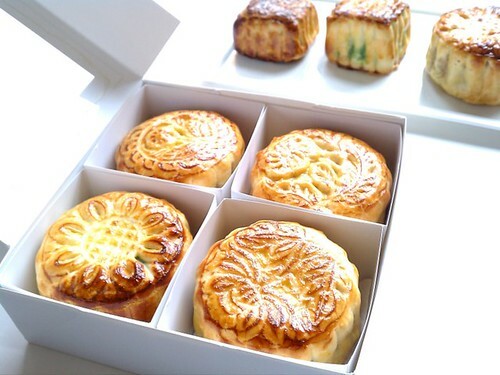 I've always wanted to make mooncakes for Chinese mid-Autumn festival [this year it's on September 12] but couldn't find easy to use molds. I finally found and bought from a Singaporean catalog one large round with 4 different plate designs and a small square with 3 plates. For the filling I used lotus seeds I bought from the Asian store and added one salted duck egg yolk in each of the 3 big ones. Some have chopped walnuts which I really like and a few I added pandan paste to the filling. I still have to learn how to make the impressions more pronounced though and I think I have to use a different recipe for the pastry to achieve that. Right now I'm happy with the way they look and I love the flavor of all of them. 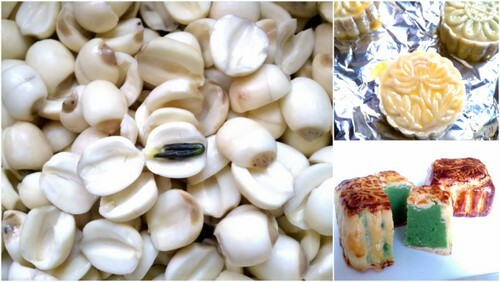 The lotus seeds I got were already shelled and only some of the seeds had the green thingie inside that needs to be discarded before cooking. 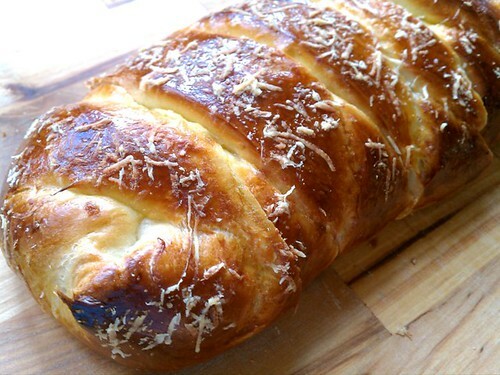 Pastry: Mix syrup, olive oil, baking soda, and water. Slowly add flour and mix with hands or rubber spatula until incorporated. It will be sticky. Cover with plastic wrap and leave on the kitchen counter for 6 hours. Filling: Wash the seeds, cover with water and soak for 3 hours. Remove the green germ if necessary. Wash 2 more times. Put in a medium saucepan, add water, and boil gently until tender. Cool slightly, then blend in a blender or food processor until smooth. Return to the pan, add sugar, and cook until all the moisture has evaporated. Cool before adding flavoring, watermelon seeds, or walnuts. 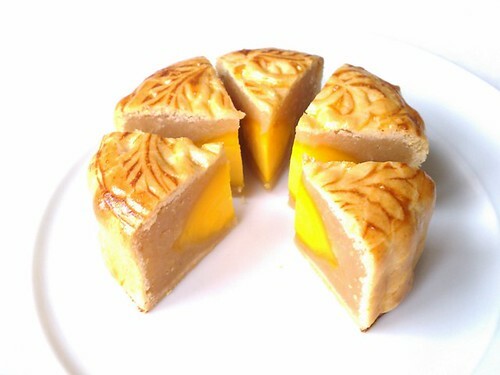 Shape and bake: Proportion should be 65% filling to 35% pastry shell. Shape portions of filling into balls. Flatten a piece of dough into a very thin round, place the ball in the center and cover completely with dough. Place the balls seams side down on baking sheets lined with parchment paper. 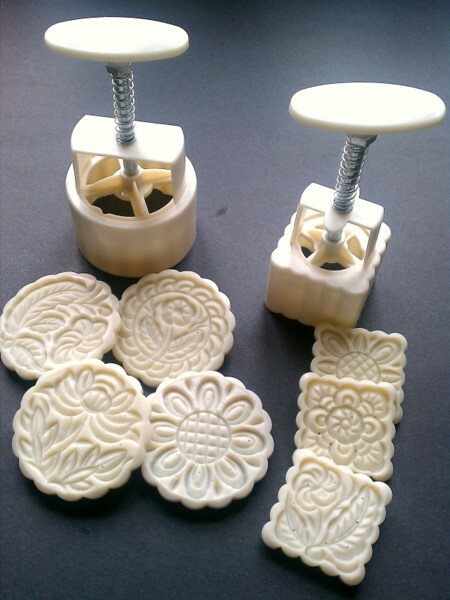 Use the mold to stamp the design or leave plain if you don't have one but flatten slightly. Brush with egg wash and bake in a preheated 400° F oven for 15 minutes or until golden brown. Cool completely before cutting into portions. 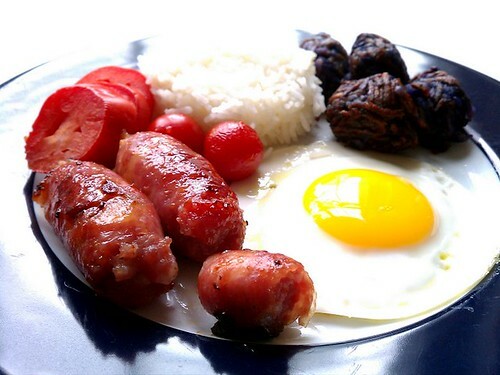 Tocino de Cielo or bacon from heaven, is another Filipino sweet inherited from the Spanish. In the Philippines, these rich silky smooth treats, made with only 3 ingredients, egg yolks, sugar, and water, are cooked in small individual molds. 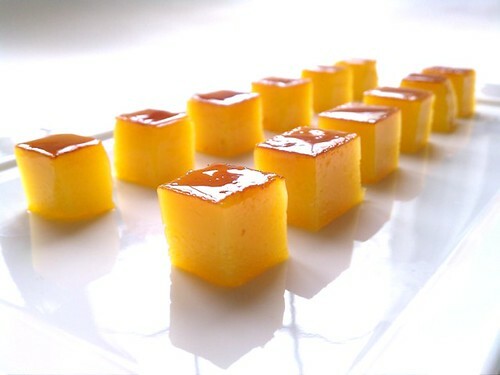 I baked mine in a small rectangular pan and cut them into one inch cubes to resemble fat back, which is probably the reason it is called tocino de cielo. In a small stainless steel skillet, melt the 4 tablespoons sugar until golden or dark brown. Pour into a 6 x 4 inch pan; set aside. Over medium heat in a small sauce pan, cook the remaining sugar and water to 200° F; let cool. 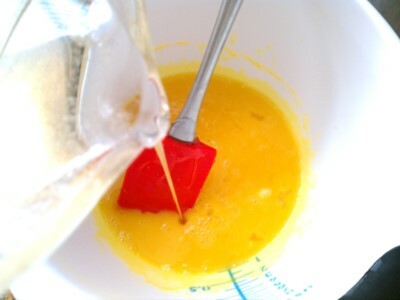 In a small bowl, stir the egg yolks with a rubber spatula; slowly pour the cooled syrup, stirring until well combined. Pour over a fine strainer into the prepared pan. Place the pan into a larger pan; carefully fill the larger pan with hot water halfway up the sides of the smaller pan. Bake in a preheated 300°F oven for 40 to 50 minutes. 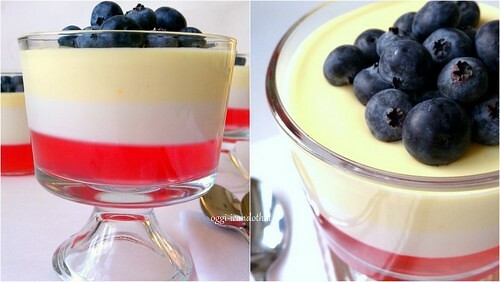 Let cool completely on the kitchen counter; refrigerate for 4 hours or overnight. Turn the pan over on a cutting board and carefully unmold. 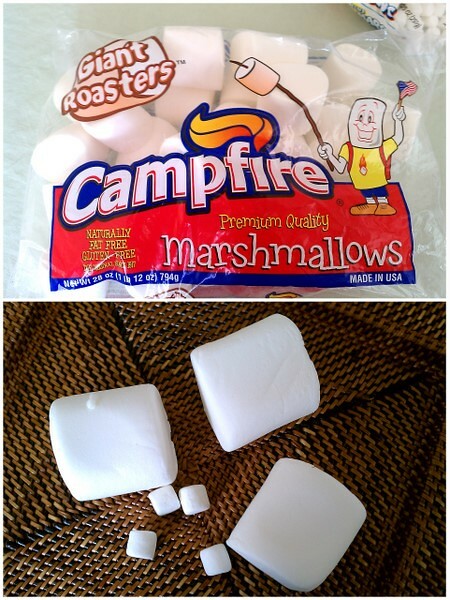 Cut into 1 inch cubes.